As Hollis Frampton's photographs and celebrated experimental films were testing the boundaries of the camera arts in the 1960s and 1970s, his provocative and highly literate writings were attempting to establish an intellectually resonant form of discourse for these critically underexplored fields. It was a time when artists working in diverse disciplines were beginning to pick up cameras and produce films and videotapes, well before these practices were understood or embraced by institutions of contemporary art. This collection of Frampton's writings presents his critical essays (many written for Artforum and October) along with additional material, including lectures, correspondence, interviews, production notes, and scripts. It replaces—and supersedes—the long-unavailable Circles of Confusion, published in 1983. Frampton ranged widely over the visual arts in his writing, and the texts in this collection display his distinctive perspectives on photography, film, video, and the plastic and literary arts. They include critically acclaimed essays on Edward Weston and Eadweard Muybridge as well as appraisals of contemporary photographers; the influential essay "For a Metahistory of Film," along with scripts, textual material, and scores for his films; writings on video that constitute a veritable prehistory of the digital arts; a dialogue with Carl Andre (his friend and former Phillips Andover classmate) from the early 1960s; and two inventive, almost unclassifiable pieces that draw on the writings of Borges, Joyce, and Beckett. "At long last, a near complete collection of Hollis Frampton's idiosyncratic, scholarly, recondite, funny writings, which might justly be called 'Offbeat Ways to Think About Everything.' A cursory look at a few essay titles—'Time, Space, Causality,' 'The Invention Without a Future,' 'Segments of Eternity,' 'Inconclusions'—reveals the astonishing breadth and brilliance of a mentor to many. This book is an invaluable resource for artists, pedagogues, autodidacts, and anyone who enjoys being intellectually provoked." 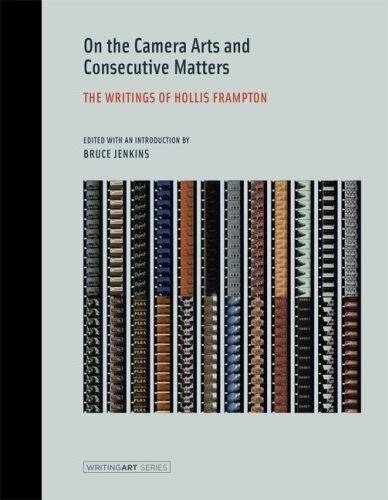 "Bruce Jenkins has combed Hollis Frampton's published and unpublished texts and from them has composed a meticulously edited and exhilarating sequence of essays, letters, notes, jottings, scripts, interviews, proposals, narratives, and occasional pieces. Frampton's writing is a torrent of eloquence, by turns philosophical, brooding, practical, witty, allusive, playful, opinionated, densely learned, and relentlessly provocative. This indispensable volume reintroduces us to the idiosyncratic sensibility and dazzling intelligence of the artist who gave us such masterworks as Zorns Lemma and (nostalgia)." "Bruce Jenkins should be thanked profusely for bringing the voice of filmmaker Hollis Frampton back into the domain of thinking about cinema and media at this crucial moment in the transformation of the cinematic institution. Frampton's quirky and manifestly brilliant essays develop a sustained meditation on the relation of life and media that transcends any narrow-minded polarization of analog and digital, film and code, experience and representation. This meditation manifestly positions Frampton as one of the most innovative visionaries of the present and future of media. How fortunate are we to have access once again to so novel and inspirational a corpus of writing by such a singular artist!"